This photograph hangs on the wall in a Gopeng Association House. It is of course of Capitan Chung Ah Kwee. Chung Ah Kwee was born as a Chen Sang Hakka in Guandong Province, China. In his late teens, he was sent to Malaya by his mother, to look for his father and brother. Ah Kwee found his brother in Larut as a wealthy and well known man known as Lui Kung Seng (God of Thunder Seng). Ah Kwee later became the head of the Hai San Secret Society and led the first batch of Chinese miners to work at Long Jaafar’s mine in Klian Pauh in 1848. Tensions arose between the Hai Sans and Ghee Hins who were mining at Klian Bharu (Kamunting). War ensued between these two secret societies and was only stopped by Captain Tristam Speedy. Captain Speedy made the Hai Sans work the mines and live in Klian Pauh which he later renamed Taiping, (everlasting peace). The Ghee Hins meanwhile were given Kamunting and mined a less richer area. 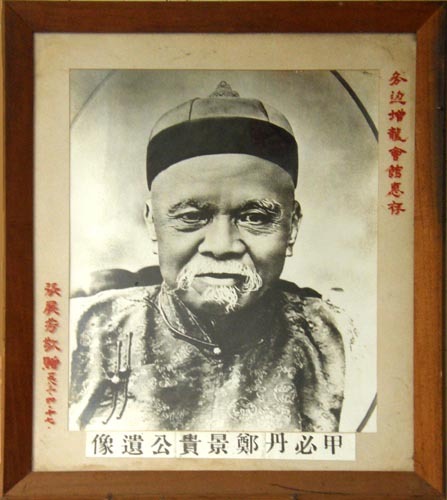 Capitan Ah Kwee practically became the founder of Taiping and owner of the largest alluvial mine in the world employing 5000 coolies. He died at his residence in Penang on 13th December 1901 and his personal estate in Penang alone amounted to seven million Straits dollars.